Karen Aitken and Associates is a professional consulting firm that specializes in full-scope landscape architectural services for large-scale commercial and residential projects. The firm also provides assistance in master planning and landscape construction. We have a wide range of project work, from backyards to world-famous theme parks, gardens to gold courses, villas to luxurious resorts. Additionally, Karen Aitken & Associates has designed thousands of residential projects of all scales, throughout the extended Bay Area and Monterey Areas. To view our residential projects, please click here. Located just south of Santa Cruz off Highway 1, Seascape Beach Resort offers 283 all-suites accommodations overlooking the Monterey Bay. You'll find the comforts of home—plus the services and features of a luxury resort. Each accomodation has a kitchen and gas-burning fireplace with a beach home feeling, which is why Seascape is unlike any other Monterey Bay resort. With 17 miles of Monterey Bay beach to explore, spacious all-suites accommodations, delicious fine dining, and a full range of activities to choose from, Seascape is the premier Santa Cruz luxury resort. Seascape provides everything to make your Santa Cruz lodging experience memorable, including a host of resort options and amenities. It all adds up to being one of the best Monterey Bay resort destinations you'll experience. That's why guests return year after year. At Seascape Beach Resort you get all the comforts of a private beach home, complete with four-diamond amenities: gourmet room service, award-winning on-site restaurant, three outdoor pools with spas, sports center, championship golf course, a host of Resort Options such as in-suite massage and beach-fires-to-go, plush cotton bathrobes, complimentary wireless internet, HD LCD TV with premium movies, select television programs, DVD player, and games on-demand. Recognized as one of California's top coastal conference centers, Seascape Beach Resort has stunning meeting and conference facilities among the best of Monterey Bay hotels and resorts. Seascape Beach Resort includes 17,000 square feet of meeting space with 15 conference rooms—most with ocean views—along with 4-star food, stellar team-building programs, and cozy ergonomic "captain's chairs." Seascape Beach Resort is proud to have a green conscience, and is committed to environmental responsibility, natural resource conservation, and lessening our impact on the beautiful natural world around us. As such, we are a certified Monterey Bay Area "Green Business," and are fully committed to promoting sustainability and using high quality eco-friendly products and services. Syngenta Flowers North America is one of the largest wholesale breeders of hybrid flower seed and cuttings in the world – developing and producing flower seeds and cuttings for growers internationally. Whether you are familiar with church life, or have no experience of any church, whether you are a lifelong Episcopalian or have no belief at all, whoever you are and wherever you are in your journey of faith, there is a place for you at St. Jude’s. This website has been designed to give you a sense of the community, liveliness, diversity, and openness you will encounter here. If you are wondering what it might be like to come to St. Jude’s on a Sunday morning, the many pictures, the description of how we worship, and information about children, youth, hospitality, and special events will help you learn about us. You will see that most people dress informally—from work casual to shorts and sandals. Everyone who comes to worship is greeted personally at the door, and given a worship booklet. Visitors are never singled out publicly by being asked to stand, raise a hand, remain seated, or introduce themselves. Children are always welcome in worship. There are activity bags at the door for their use—an usher can find one for you. Childcare and Sunday School are available for infants through elementary school, if you prefer to use that option. We want you and your children to be comfortable and relaxed. The 8:00 service lasts about 50 minutes. The 10:30 service lasts about an hour and 10 minutes. After each service refreshments are served in the parish hall or, weather permitting, on the patio. Community and friendship are what people most often name as the reason they come to St. Jude’s. I hope you will come and discover that for yourself. The Winchester Mystery House is a mansion in San Jose, California, that was once the personal residence of Sarah Winchester, the widow of firearm magnate William Wirt Winchester. Located at 525 South Winchester Blvd. in San Jose, the Queen Anne Style Victorian mansion is renowned for its size, its architectural curiosities, and its lack of any master building plan. It is a designated California historical landmark and is listed on the National Register of Historic Places. It is privately owned and serves as a tourist attraction. Since its construction in 1884, the property and mansion were claimed by many to be haunted by the ghosts of those killed with Winchester rifles. Under Winchester's day-to-day guidance, its "from-the-ground-up" construction proceeded around the clock, by some accounts, without interruption, until her death on September 5, 1922, at which time work immediately ceased. Sarah Winchester's biographer, however, says that Winchester "routinely dismissed workers for months at a time 'to take such rest as I might'" and notes that "this flies in the face of claims by today's Mystery House proprietors that work at the ranch was ceaseless for thirty-eight years." The Boardwalk extends along the coast of the Monterey Bay, from just east of the Santa Cruz Municipal Wharf to the mouth of the San Lorenzo River. At the western edge of the park lies a large building originally known as The Plunge, Now Neptune's Kingdom, A Pirate-themed recreation center which contains a video arcade, and indoor miniature golf course. Next to this is The Casino Fun Center which includes a laser tag arena and next to that (To the Right) is The Cocoanut Grove banquet room and conference center. A Laffing Sal automated character, from San Francisco's Playland, is viewable near the miniature golf course. East of the Casino, the boardwalk portion of the park stretches along a wide, sandy beach visitors can access easily from the park. 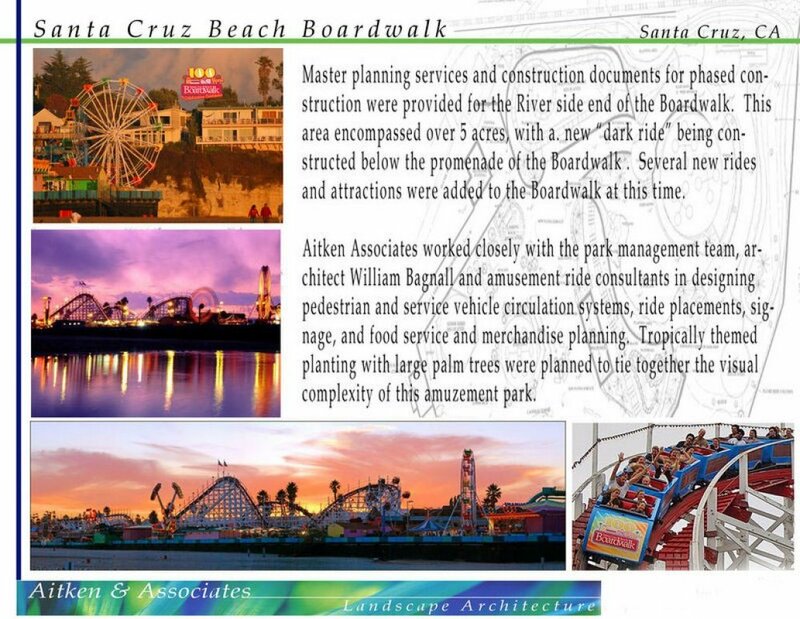 The eastern end of the boardwalk is dominated by the Giant Dipper roller coaster, one of the best-known wooden coasters in the world and one of the most visible landmarks in Santa Cruz. The Dipper and the Looff Carousel, which still contains its original 342-pipe organ built in 1894, are both on the US National Register of Historic Places. They were, together, declared to be a National Historic Landmark in 1987 and the park is California Historical Landmarknumber 983. There are old-fashioned carnival games and snack booths throughout the 24-acre (9.7 ha) park. It is located at 400 Beach Street in Santa Cruz, 36°57′51″N 122°01′04″W south of the Ocean Street exit of California State Route 1, which is the southern terminus of California State Route 17. The beach was a destination for railroads and trolleys from 1875; a short passenger service to Henry Cowell Redwoods State Park was restored in 1985. The Santa Cruz, Big Trees and Pacific Railway stops in front of the park. As of 2011, the park is headed by Charles Canfield, the son of Laurence Canfield, the president of the park from the 1950s until the early 1980s. It has won the Best Seaside Amusement Park Award from Amusement Today every year since 2007 except for 2015 . Although there is no admission and the beach is public, parking is charged a fee when the rides are open. Season or day passes can be purchased or tickets for one dollar; each ride costs between 3 and 7 tickets. The Gardens & Alhambra (Subdivisions by KB Homes) – Gilroy & Hollister, CA. Sobrato Community Apartments – Gilroy, CA.